Like Toshi, I’ve been reading the manga I Am A Hero, and like Toshi, I’ve been loving it. But I wanted to spend some time today looking at one aspect in particular that leaves me speechless every time I flick through it, and that’s the art. One of the things that I love about my favourite manga (Blame!, Akira, Lone Wolf & Cub) is the quality of the linework amongst the best artists. While the majority of Western comics end up coloured, many manga are drawn solely in black & white; while there are practical considerations behind this (it’s faster for serialization), I also tend to prefer it, because it helps draw my eyes to the finer details, which in turn can really help immerse me in a comic’s world. I Am A Hero is gorgeous throughout, an effective blending of gritty realism and stylised action (there are even sections drawn from an FPS perspective), but Kengo Hanazawa’s art really gets inside your head every 10-20 pages, when he takes a break from writing and just blows out an entire page (or two), devoting it to a single frame. Occasionally this is to show some important action, but most of the time it’s just...art, a still shot amidst the chaos of I Am A Hero’s zombie apocalypse, maybe a landscape shot showing a city in ruins, maybe a close-up of some zombies to give us a good look at how gross they are. Sometimes it sets the mood, sometimes it’s framing a key moment, other times it’s directly influencing the pacing, breaking up the flow to act as the pause before the plunge. Regardless of the subject or the intent, every time he does it, it’s absolutely incredible. 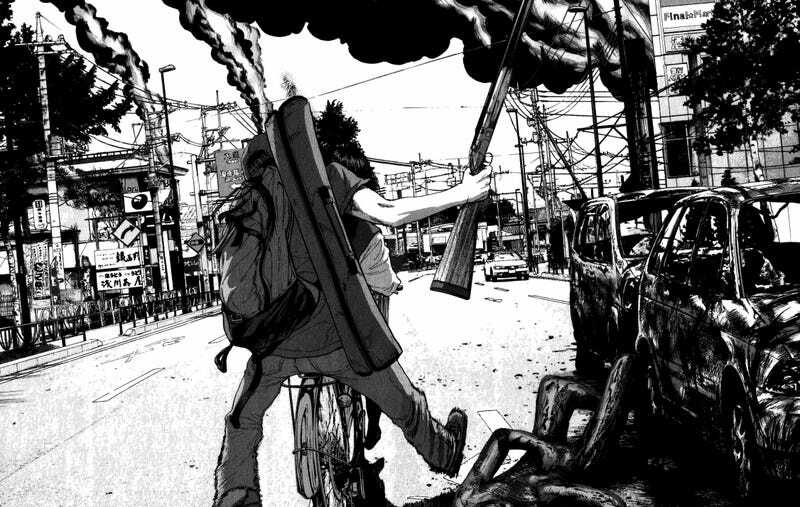 I’m loving I Am A Hero for other reasons, too—the contrast of Japan’s polite culture and awkward otaku vs a zombie apocalypse is a fascinating hook—but mostly it’s just because I cannot get this art out of my head. Dark Horse will be releasing an English-language version of I Am A Hero, starting with Volumes 1 & 2, in April 2016. Look out for it when it lands, because I can’t recommend it enough.